On top of the open hostility that Kagame displayed in Switzerland on May 8, 2015 against Burundi and the current fact of his hosting of rebel leaders fighting president Pierre Nkurunziza, one would ask why the west (EU and US) plus Uganda appear also politically and publicly opposed to that country? The answer is to be found in the regional politics and appears as well to be of the cold war nature prior to 1990s and recent developments in Ukraine. In order to safeguard regional stability SADC countries need to preserve peace and stability militarily as they did in the Democratic Republic of Congo (DRC) in 1998 and 2013. Back in 92/94, the Rwandan Patriotic Front (RPF) created total political insecurity in Rwanda killing several Hutu politicians (Emmanuel Gapyisi, Martin Bucyana, Felicien Gatabazi, Pierre Rwambuka and many others) from the whole national political spectrum in order to have chaos that would enable the rebel group take power in the country. This was part of a grand scheme which was going to involve or affect several countries of the region namely Uganda, Burundi and the Democratic Republic of Congo then called Zaire. After killing the first ever elected Burundian Hutu president Melchior Ndadaye in October 1993, the first phase of the regional human tragedy was triggered. However it could be rightly claimed that the humanitarian catastrophe had already started a few years earlier because only in Rwanda, by the beginning of 1994 and before the fatidic April 6th of that year which saw the assassination by RPF of two hutu presidents (Juvenal Habyarimana of Rwanda and Cyprien Ntaryamira of Burundi), there was more than one million of internally displaced people living in miserable conditions in the outskirts of the Rwandan capital Kigali. They had been fleeing atrocities committed by RPF in the areas of Byumba and Ruhengeri (north of Rwanda) where it had, starting from October 1st, 1990, invaded the country coming from Uganda. President Museveni of Uganda was fully backing the Rwandan rebels returning them favor because they had helped him take power in 1986 in Kampala. With the collapse of communism, US remaining the sole superpower, decided to increase its strategic influence across Africa, a continent predominantly under French and British clout because of colonial ties. US would base their African strategy on partnering with minority communities, particularly in Uganda, Rwanda and Burundi whose legitimacy in power would not come from popular acceptance but their dependency on external support. The strategy has worked so far for US. It has enabled the superpower to control the resource-rich Democratic Republic of Congo. Furthermore it has made Uganda and Rwanda to become the launchpad, through UN peacekeeping missions, of military forces across the continent, which are African by name but foreign in pursued interests. 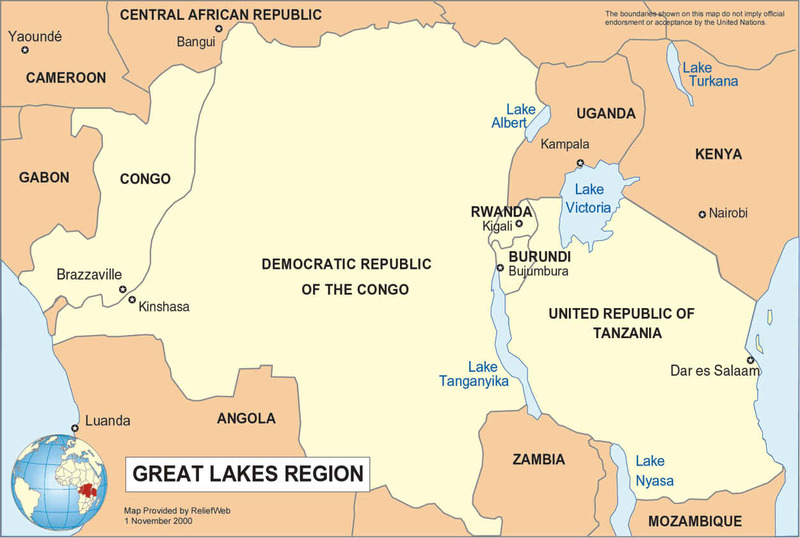 For people of the Great Lakes region, that strategy has cost more than 10 million lives. History is repeating itself in the neighbouring Burundi, Rwanda playing the backers of the rebels fighting against the central government of that country. In 2012 president Paul Kagame was backing M23 on his western border with DRC. And everyone can see that Rwanda has allowed itself to go on with this role of regional troublemaker because it is sponsored by powerful western nations, particularly US and UK. Last month in Addis Ababa when Barack OBAMA singled out Burundi among the most unlawful regimes on the African continent trying to extent terms in office for their presidents, it was like warning president Pierre Nkurunziza and giving the green light to more chaos in Burundi. This was being confirmed while these lines were being written. Comparatively, among the four countries of the Great Lakes region of Africa, namely Rwanda, Burundi, Uganda and Democratic Republic of Congo, it could be rightly said that it is in Pierre Nkurunziza’s one where the regime has been in power for the fewest number of years. He has only been in office since 2005. This means 10 years. In April this year the Burundian president was presented by his party as its candidate for the upcoming elections. Despite all the controversy surrounding the interpretation of the country’s laws regarding how long a head of state is allowed to stay in power, Pierre Nkurunziza has been elected on July 21st, 2015 for a 2nd and last term according to the constitution. Yoweri Museveni has been in power in Uganda for almost 29 years and still counting. He is currently aiming to be there for life. He is currently on course to participate in 2016 elections. Paul Kagame of Rwanda is the strongman of the country since 1994. US and EU are fully backing these dictators despite their killing spree along several decades and across countries. 21 years of power for Paul Kagame still seem not enough since he is doing everything to change his constitution and stay in office. Joseph Kabila of the Democratic Republic of Congo who came into power in 2001 is trying to do the same but through different stratagems. Since April 2015 when Nkurunziza announced his presidential candidacy for the upcoming elections, illegal protests almost took over the capital city Bujumbura. The unsuccessful military coup of May made a second dent in Nkurunziza power. From a closer look to the Burundian political scene, there are noisy and externally supported factions in the opposition, and ready for anything even seeing their country descending into chaos. They are not interested in democratic change, but political alternance through concertation and power sharing without people’s consultations. Protests that killed around 100 people so far since April 2015, rumors of genocide against Tutsi propagated by Rwanda, and more than 100,000 Burundians fleeing their country, assassinations of important personalities including Zed Ferusi in May and General Adolphe Nshimirimana on August 2nd, all this does not predict a peaceful and sustainable future for Burundi. WHY BURUNDI AGAIN AND THIS TIME PARTICULARLY? Pierre Nkurunziza has refused to become a docile puppet of Museveni and Kagame in their grand scheme of controlling or having influence in the whole Great Lakes region working for the narrow interests of their Nilotic and Hamitic communities and those of foreign countries at the expense of the majority of Bantu people. The fierceness which continues being demonstrated by president Paul Kagame against Burundi finds another explanation in the fact that he must create a national and regional political context taking away from people’s minds his illegitimate will to stay in power after 2017. He is doing everything to make look as secondary his current manoeuvrings to change the Rwandan constitution. In the extreme situation, president Kagame might wage an open war under the disguise of Burundian refugees returning home to remove a president that his people don’t want, here only paraphrasing what he said in Switzerland about the Burundian president. In that case, he would’ve shown how a good student of Museveni he would’ve been, because he would be replicating exactly the 1990/94 scenario where his RPF invaded Rwanda with Ugandan backing. This picture makes understandable the reason Kigali has been propagating for a number of months if not more than a year or so the spectre of a tutsi genocide in Burundi in the purpose of getting more Burundian Tutsi fleeing their country and particularly ending in Rwanda. It is in the general public eyes now that Burundian Tutsi refugees who arrived in Rwanda after the insecurity started increasing in their country from April onwards are being treated like endangered species, receiving all the international support necessary. Kigali has even apparently given them automatically the status of refugees without examining individual cases, as this is the normal practice in the field. MTN telecommunication company has in Rwanda even offered free mobile talk time to allow them to speak to their relatives left behind. But one wonders how many Burundians in rural areas have mobiles in a population whose GDP is among the lowest in the world. Those mobiles are instead thought to be tools of recruitment of fighters for the rebels who are luring young Tutsi refugees recently arrived in Rwanda to join them. WHICH INTERESTS DOES THE WEST HAVE IN BURUNDI? One would probably be the old objective of getting Eastern CONGO detached from the central government in Kinshasa which hasn’t completely gone away. In 1996 when the coalition of Uganda, Rwanda and Burundi attacked simultaneously the then Zaire with the full backing of US and other western interested parties, the intention was to occupy the country for total control. Such objective was partially achieved. In fact, though the invaders were officially booted out having however caused serious damages to the sustainability of the Democratic Republic of Congo, western interests could this time be looked after by MONUSCO, an international structure working more to preserve its funders’ interests (mainly US, UK, Canada, etc) than anything else but peace. Thus, the plan has not fully worked as initially brought together. The balkanization of DRC being a long term project, executed at a different pace and within subsequent phases, the Burundi piece of the puzzle, though apparently essential has been missing for the last decade or so. It was effective when the country was led by the Tutsi president Pierre Buyoya during the first invasion of DRC in 1996, but since the leadership passed to Hutu leaders through ARUSHA agreements of 2000, the country has been reluctant to actively take part in the destabilisation of its neighbours as Uganda and Rwanda do. Additionally, the discovery of important reserves of nickel in Burundi seems to bring another dimension to the current political situation. It partially explains the ferocious interest of the west in that poor country. President Pierre Nkurunziza having concluded contracts of exploitation of that mineral with Russian companies, this does not arrange western governments which have put economic sanctions on Putin’s country because of the Ukraine conflict. That Rwanda and Uganda be the proxy players acting for western interests in the matter wouldn’t be new in the Great Lakes region. Again the attitude of the west in the Burundian instable situation seems to express a deja-vu pattern. US and their western allies don’t care about human casualties in African conflicts as long as their interests are preserved with African blood. This is where and when Africans themselves must step in to stop the bloodshed. As highlighted in this text, it cannot be any Africans to come to the rescue of Burundi. SADC countries would be the most appropriate to intervene to defend the continent against “local warlords”, namely presidents Kagame and Museveni who, through wars, serve their selfish interests and those of their western masters.